Lawcover Insurance Pty Limited (Lawcover) can offer law practices the option of extending their policy limit from the primary $2 million up to $20 million under its Professional Indemnity Insurance (PII) policy, subject to underwriting criteria. Lawcover’s Top Up insurance is provided by a simple endorsement to the primary policy and is provided on substantially the same terms as the primary policy. Clients who have suffered loss as a result of the demonstrable negligence of their solicitors will be compensated for that loss as quickly as possible. 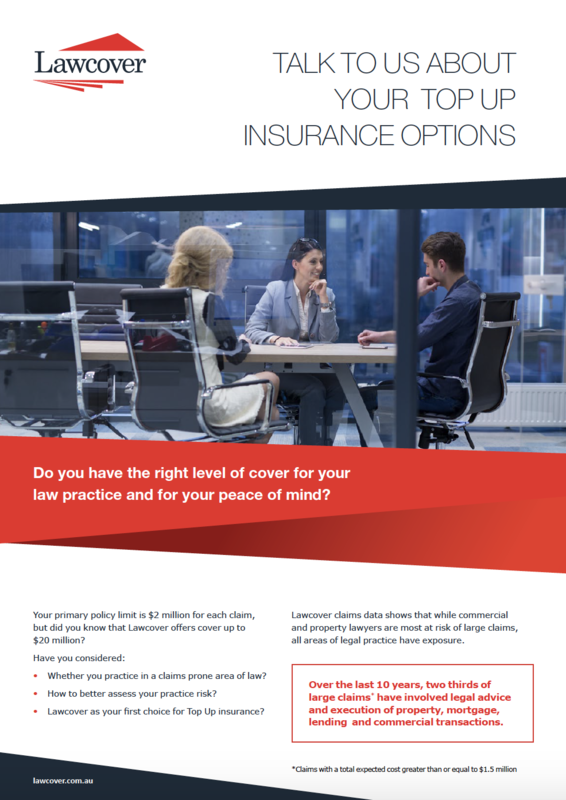 Once indemnity has been confirmed for a claim, solicitors can have the peace of mind that Lawcover will always act on their behalf, up to the limit of indemnity that they have chosen. There is a continuity of cover clause in the endorsement to the effect that law practices which have purchased Top Up insurance from any insurer for at least one year immediately preceding the period of insurance, have the benefit of continuous claims-made cover for previously notifiable facts or circumstances (other than for fraudulent non-disclosure or misrepresentation). If you have any questions about Top Up insurance please contact our Insurance Services Team on 1800 650 748 or insuranceservices@lawcover.com.au. Before you enter into a contract with Lawcover Insurance for Top Up insurance, you have a duty, under the Insurance Contracts Act 1984 (C’th), to disclose to Lawcover every matter that you know, or could reasonably be expected to know, is relevant to Lawcover’s decision whether to accept the risk of the Top Up PII endorsement and, if so, on what terms. You have the same duty to disclose those matters to Lawcover up to the commencement of the Top Up PII endorsement and before you renew, extend, vary or reinstate the Top Up PII endorsement. If you fail to comply with your duty of disclosure, Lawcover may be entitled to reduce its liability in respect of a claim or may cancel the endorsement. If your non-disclosure is fraudulent Lawcover may have the option of avoiding the endorsement from its beginning. Top Up insurance is provided on substantially the same terms and conditions as the primary PII policy but there are some differences. You must comply with your duty of disclosure as set out above, and Lawcover retains its rights to cancel or avoid the Top Up PII endorsement. There is continuity of cover for circumstances that are notified late (but not where there has been fraudulent non-disclosure or misrepresentation) for law practices that have had Top Up insurance for at least one year immediately preceding the period of insurance. The limit of indemnity and excess may not be the same. You must read the Top Up PII endorsement carefully to ensure that it meets your needs. The PII policy (including Top Up PII endorsement) is a claims made policy of insurance. This means that the policy covers you for claims first made against you during the period of insurance. The claim relates to, or arises out of, any fact or circumstance prior to the commencement of the endorsement, and which an insured was aware, or reasonably should have been aware, might give rise to a claim against an insured. You also have a statutory right under section 40(3) of the Insurance Contracts Act 1984 to cover for claims arising out of a circumstance that may give rise to a claim against you if you notify the insurers in writing during the period of insurance. If your Top Up PII endorsement shows a retroactive date, the Top Up PII endorsement will not cover claims that arise from matters, facts or circumstances that occurred prior to the retroactive date. We offer run off cover for your Top Up insurance when your law practice ceases, subject to certain criteria.